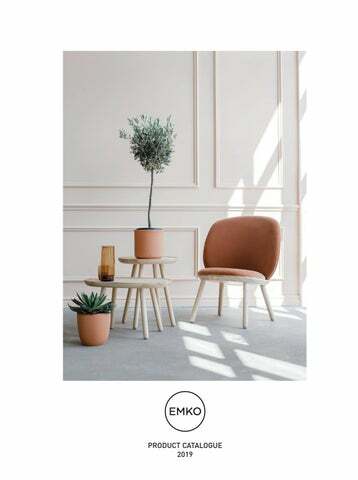 WHO WE ARE EMKO IS A LITHUANIAN-BASED FURNITURE DESIGN AND HOME-ACCESSORY COMPANY. OUR ROOTS ARE SET IN THE ANCIENT BALTIC TRADITION OF CRAFTSMANSHIP, AT THE INTERSECTION OF THREE DISTINCT CULTURAL SPACES: THE NORTHERN SCANDINAVIAN, THE WESTERN EUROPEAN AND THE EASTERN RUSSIAN. OUR PRESENT IS OPEN AND INVITING, WELCOMING TALENTED DESIGNERS FROM ALL OVER THE GLOBE. We design and manufacture for an active, modern, responsible market. Our customers’ base ranges from the dynamic professionals interested in inviting fresh ideas inside their life, making choices outside the box, to the creative artists who wishes their workspace to be a reflection of the passion put in their own creations. We focus on a small diversity of award-winning furniture pieces, creating a niche for the curious solutions to be embodied. Their simple beauty generates optimism and wellbeing inside the place we call home or workspace. Their smart design brings comfort to everyday tasks. The quality of the craft and of the materials insures a long-term relationship, a constant satisfaction that you’ll enjoy for years to come. It takes one glance to see their beauty. It takes one touch to get their functionality. Naïve Low Chair by etc.etc. Naïve Side Table by etc.etc. Naïve Side Table is available in 3 sizes, each carved out of a single piece of solid ash. A form in between a square and a circle creates a soft and welcoming appearance and will easily adapt to any type of room. The tables can be easily assembled by just screwing the legs in. The tables work well on their own, or all three together. 4.9 by Marius Valaitis The unusual name of the 4.9 Desk has a story to tell: it reflects designer’s Marius Valaitis desire to play with the concepts of perfection vs. flaw. For that it’s almost five, missing just a tiny bit. This translates in the angles of the desktop, which, at its end, has a “crack”, a slit not just for storage, but also to bring closure to the desk’s core idea. The “imperfection” aside, all the details of this piece of furniture have been made with perfect accuracy. It not only brings convenience and efficiency to work, but adds a little bit of style to it as well. Beauty cannot be empty, for sure. But functionality can be beautiful. My Writing Desk by etc.etc. A writing desk, designed for the working people. For the creative people. People who know the value of efficient work. While developing the idea of the My Writing Desk (MWD), designer Inesa Malafej had a clear goal – to reduce the chaotic clutter that creative work brings to the table. The result is a desk which has its storage space organized around the table-top, where the objects are always in sight and easily accessible. This enlarges the desktop beyond its edges without the worry that things might fall down. Furthermore, any unnecessary objects can simply be pushed to the sides, for storage. The high edges of the desk isolate it in the room and create a positive microclimate where things “feel good” in relationship to the user. The wings are divided, leaving space for the electrical wires. MWD features two drawers, to store a laptop and other working tools. The legs of the table can be twisted off for easier transportation. For smaller, cosier spaces, a one drawer version was created. MWD is Inesa’s graduation project from the Vilnius Academy of Arts. Add to that the modern life style, which has slowly pulled us away from the Sun’s natural cycles as we have moved our activities towards the indoors, inside closed spaces which have shut off our contact with the elements, and our longing for the natural benefits of the Sun increased. Created during the dark Lithuanian winters comes “SUNrise/ SUNset”, a lamp that puts the Sun’s colours in the palm of your hand. Winner of the International exhibition Furniture 2012 from Vilnius and the Red Dot Design Concept Award in 2014, this interactive object gives its user the possibility of choosing the right colour palette to suit the desired mood effect according to the moment of the day or personal preference, by gently sliding the light source over the coloured panel. It brings the vibrant and refreshing coolness of bright mornings inside your office or the warmth of cosy evenings to your living room. Multifunctional Pill Cabinet by Dalius Razauskas The Multifunctional Pill works great in the treatment against clutter and messy environments. The Pill is a round cabinet that works fixed to a wall and can instantly transform into a fully-functional working place, a dressing table, or even a bar! Attach it at standard table height, a bit higher or a bit lower â&#x20AC;&#x201C; itâ&#x20AC;&#x2122;s your choice. The shelving system inside is designed with the idea to allow the user to change and adapt it easily: it can fit a laptop, standard files, catalogues, books or any other personal belongings. Furthermore, the Pill comes equipped with sockets and the option of integrating LED lights. The materials and the fittings used into manufacturing are providing a reliable desk transformation and tabletop stability. Pill suits perfectly to every kind of interior, enabling you to have a hidden space for your items. Naïve Semi Bar Stool by etc.etc. The Naïve Semi Bar Stools stand out with their unique and recognizable character. A carved seat with a minimal backrest makes it comfortable enough for a long chat between friends, while durable steel footrest suits both home and public use. Naïve Chair by etc.etc. It feels as if the Naïve Chair could have been drawn by a child – six sticks and one seat. That’s all there is to it! This playful chair is stripped to the minimum: a carved solid ash seat and six legs of equal length to screw. It takes pitch-perfect accuracy to design its simple looks. Every single detail is carefully studied, the length and angles of the legs are engineered to obtain the best proportions and to offer superior ergonomics and a great sitting position. All this and the added flexible foam backrest make Naïve a surprisingly comfortable chair. It takes a minute to assemble it, and another one to flat-pack it back into a small box for transportation or shipping. As an extra feature, the easily interchangeable parts enable the user to play with the chair’s colour palette, from classical solid wood to a mix of joyful tones. NaĂŻve Dining Table by etc.etc. Tableâ&#x20AC;&#x2122;s modest and clean form is decided by a simple but lasting construction - each leg has its own base under the tabletop making the table strong enough to serve generations to come. The roundish tabletop contour is designed to create an inviting and cosy atmosphere for everyone sitting around it. The table is available fully oiled or with a coloured body revealing just the oiled ash tabletop surface. The WHYNOT! design team has created the Lietuva Rug after being inspired by the Lithuanian identity â&#x20AC;&#x201C; its ancient traditions, its colours, clothing and handicraft. One of the unique Lithuanian craft elements is the colourful woven stripe once used in the national costumes. Different yarns are interwoven together and create geometric patterns, while the stylized flowers are ending in elegant colour combinations. In the carpet, these artistic signs are used next to the contemporary modern linen craftwork, bringing together a touch of the Lithuanian spirit. Lietuva is available in different colours which define the Lithuanian nature: the blues of the lakes and winter frost; the light greys reflecting the sky; the greens of its woods contrasting with wild sand dunes. A reflection of Lithuania portrayed in the Lietuva Rug. Silvia CeĂąal was inspired by a sweet meringue-based confection made with simple ingredients like eggs, icing sugar, granulated sugar and almond powder. However, making the perfect sweet is not an easy task. Macaron Lamp follows the same idea; combining simple materials with the right proportions, in order to get a lamp with personality. Wood conveys us warmth and strength. Along with the cord which links between the two pieces of wood, giving a touch of originality with its texture and colour. It happens quite the same when it comes the Macaron with different flavours combining perfectly in it. Creation of this modern and classy Serving Stand Babel was inspired by the children‘s game „Throw a ring“. It is a composition of two scooped wooden plates and a central pole combined with solid brass handle. Same as in game, the plates are easily removed and might be used separately, afterwards, mounted back onto the central pole. All the wooden parts of Babel are made with precision from solid ash and finished with oil certified for contact with food. Babel will easily become a part of your daily life with a use for fruits, nuts, chocolates and more. The plates also can be flipped over when the flat surface is needed, for instance, to serve the cupcakes. This art material fits perfectly in each home due to its minimalistic design and warm materials used. Aye Aye! Candleholders by etc.etc. Aye Aye! is a family of rugged, round and bold iron cast candleholders inspired by the time of adventure and discovery, when the enthusiasm of the Industrial Revolution revealed the world to travellers and fortune seekers. The fleet is composed of four sizes â&#x20AC;&#x201C; from a small tugboat with one funnel to a hefty steamship with four big ones. All navy-themed colours are available: red, blue, black and grey. Each funnel is designed to fit either a tea-light candle for cosy harbour light or a taper candle as a pillar of steam. It is an ancient Arabic tradition to cover the floor of the rooms with carpets of different size, colour and pattern. This is the inspiration behind the Over Rug, designed by the WHYNOT! Team. It comes in two shapes â&#x20AC;&#x201C; the first a large square carpet, with a strong character, the second a longitudinal comfy stripe. You can admire how its different shades are matching together with different patterns, all while keeping intact its simplicity and aesthetics, giving a unique harmony to the composition. Over is a discreet protagonist, an equilibrated handmade patchwork, offered in two shapes: square for the heart of the room and stripe for the corridors or cosy places. Foldin Shelving Unit by etc.etc. The Foldin Shelving Unit is characterized by simplicity. However, its strong construction is built to sustain the needs of the modern consumer. This modest wooden knock-down shelf can vary in size and form. The design is inspired by Japanese aesthetics and adapted to a Western type of furniture. The shelf is assembled out of one framework and foldable shelves. Each shelf is built from three plywood plates joined with a sheet of felt. Moreover, the set comes with two hooks, so attaching them on the frame enables the user to hang some personal items on it, as well. This cosy and light piece of furniture suits perfectly in almost every interior: customers install it into offices, living rooms or use them in the childrenâ&#x20AC;&#x2122;s room to store their beloved books. Removing or replacing the shelves is as simple as that, by folding the sides and storing them flat-packed. This simple solution to store shoes and always have them in sight, designed by Tore Bleuzé, feels so obvious and natural that it’s almost strange it hasn’t been used before. All you need to do is gently put Step Up against a wall and it will do the job. It doesn’t take a lot of space and it can be easily relocated. 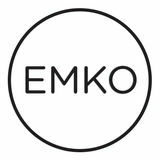 The smaller version of this shoe rack, the Step Up Mini, has been welcomed into the EMKO range as well. Used by itself for smaller shoes or smaller spaces, or in combination with its “bigger brother”, the Sep Up family can now fit everyone’s needs. NaĂŻve Stool by etc.etc. The smallest member of the NaĂŻve family. A tiny but sturdy item that will find itself useful in many spaces and situations. Assembled out of a carved solid ash seat and three legs to screw. BARBORA ADAMONYTĖ-KEIDŪNĖ Product designer Barbora Adamonytė-Keidūnė, Master in product design, graduate of Vilnius Academy of Arts, 2016. The designer mainly works in the field of small-size design objects, such as dining items and houseware that facilitate household. The works of the designer have been awarded with RedDot Design Concept Award, Good Design prizes and other awards that incite thinking, creativity and further idea development. 1984-1988 Studied at Kaunas High School of Applied Art, department of glass, Lithuania . 1988-1993 Studied at the Vilnius Art Academy, department of design, Lithuania . 2007-2010 Studied jewelry design in gallery “Darijaus papuosalai”. Since 1993 interior, furniture, industrial and jewelry designer in Vilnius, Lithuania. SILVIA CEÑAL Silvia Ceñal was born in San Sebastián in 1985. After studying a Technical Ingeneering in the University of Basque Country, she extended her knowledge in Groningen (Netherlands) and Florence (Italy). After a short period working in different studios, she increased her know-how in furniture design at IED in Madrid. Nowadays she works with companies of furniture and lighting sector such as Lithuanian company Emko, Portuguese company Two Six, Spanish companies Lufe, Massmi and Oi Side. TORE BLEUZE Young and versatile industrial designer. He received his M.S. degree in Industrial Design at Howest, University College of West Flanders in 2007. Over the past 8 years he has worked as a designer on projects ranging from multidisciplinary academic research through to creating new products for several companies. He developed ‘design to connect’, an online joining methods inspiration database for designers. Also he organised several editions of ‘shaping matter’, an event and exhibition on innovative materials in Belgium. ZP STUDIO Matteo Zetti and Eva Parigi are architects and designers trained in Florence. The goal is to find the perfect balance between tradition and avant-garde. To achieve this, they rely on the expertise of master craftsmen from Italy and abroad. Their experimentation has allowed them to create items that express the value of a manufacturing network based on know-how and manual skills, often combined with the most cutting-edge materials and technologies. WHYNOT! Whynot is a team of freelance designers with over 10 years of experience designing products in various markets. The team has extensive expertise in the field of product design, in all its phases and aspects using an analytical and creative approach.